Ok, so we’ve been using this for some time now and well, I’ve got to tell you – honestly, this is probably my #1 favorite item of Nuby! I mean, what’s not to love about it? Finally, a suction base that really sticks – even to woodgrain/textured table tops like ours! When I heard about this product I thought immediately, “yeh, I’ll give a try” especially since we do BLW (starting around six months) and with BLW comes a lot of mess and the last thing I need on the ground is the whole bowl/plate itself with all the contents on the floor as well. However I am not one to be easily convinced, especially with a baby girl that has yet to find a suctioned bowl or plate she couldn’t easily rip off the table and throw to the ground. For some reason when our littlest Penelope sees a bowl/plate in front of her, her instinctual actions always has her pouring the contents of said bowl/plate over her face (trying to get it in her mouth and only to succeed maybe 10% of the time, if that). I find that the problem with MOST of these suctioned bowls/plates is the actual base itself. The suctioned part of the product only covers a small area of the actual size of the bowl/plate leaving little hands to easily grab the largest part and yank off (especially easy when the suctioned part barely sticks to the wood grain/textured tabletop like ours). The Nuby Sure Grip Miracle Mat Suction Plate however covers a wider area, well over the actual bowl size. The (whole) plate itself is made of 100% silicone, BPA free, with super gripping action and a built in suction grip that easily seals to tabletops. Unlike other mats this one is thinner than most of the better gripping action mats but not as thin as the flimsy counterparts, better yet, this one has the bowls attached! My first thought upon receiving this mat is that it seemed kind of small, but once food was placed into the bowl I realized it was perfect size for baby’s portion control. And by this, what I really mean is mama’s portion control. I always tend to over-do the amount of food for my babes and most of it ends up on the chairs or floor. The size of the bowls on this mat however seems to be just enough. The mat is also a great size for most small tabletops as those that fit to your highchair already. It’s also perfect for travel as you can easily stick this in your diaper bag no problem and wipes clean easily. TIP: When I read first few the arguments about this mat under the comment section on Nuby’s IG when they posted our sample video HERE, one that really stuck out to me was that some babies can probably still peel off and throw this mat (which in reality, maybe he/she can), but really if you think about it the bowl is centered and if you actually press down on the center of the bowl before pressing down on the “thin” edges of the mat you can actually create quite the suction and with the thin edges of the mat little fingers are harder to pry under. Also, make sure the tabletop is clean! Penelope is always up for a challenge and I would be lying if I said she never once peeled up this mat, but I will tell you, when she did it was usually because I didn’t place the mat down in the most effective way as I just mentioned. So my tip is to place the mat down first in the position you’d like it to be then add the food. Hope this helps! Now available to purchase at: Amazon and Babies R Us or better yet, WIN ONE! 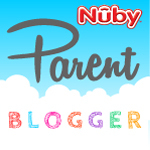 We have teamed up with Nuby for a GIVEAWAY! We are giving you two chances to win a Nuby Sure Grip Miracle Mat now! One way to enter: You may enter by leaving a comment below telling us what your baby’s favorite foods are. Second way to enter: Head on over to our IG pages and FOLLOW @TiffWall & @NubyUSA, like the post featuring the Nuby Sure Grip Miracle Mat. And that’s it! (BONUS EXTRA ENTRIES – Tag your friends or comment below telling us why your kid needs this mat, separate comment for separate entries). Our favorite foods right now are bananas, blueberries, salmon and brown rice and Brussels sprouts! Isaac is really into broccoli lately. I’ve been blanching then in beef or chicken broth and its been like crack!! And as always since he’s an Asian baby he’s got a soft spot for rice. WINNER IS JULIE. Please email shipping address to tiffanyjen wall @ gmail .com Thank you all for entering! Hi Tiff! Here’s hoping I win a mat for Lewis. I BLW as well and luckily this boy eats everything. His favorite dishes include: meat, noddles, rice, and fruit. Glad I saw this post! Favorite foods right now are bananas and toast! My daughter loves eggs in the morning. While I cook them, I give her wheat bread with peanut butter. For lunch it varies, but daddy gave her hotdogs and she’s really enjoyed that. For dinner she gets what we eat and she loves chili with crackers. 🙂 she just loves to eat anything really.